You are here: Home / What We Do / What is Media Psychology? Psychology is key to understanding the implications of technology. Consequently, it seems like it should be pretty straightforward to define media psychology. For some reason, though, it’s not. I have had discussions with colleagues for hours (or at least it seems like it) about what constitutes media, mediated communication, and technology and what we mean by psychology in the context of media—and we’re not even philosophers. In this and the following two posts, I will discuss my definition of media psychology and why I think media psychology is so important. Both media and psychology have made major contributions to western culture throughout the 20th century. Can you imagine The New Yorker without Freudian references or Jason Bourne without operant conditioning? The term “media,” however, used to be confinable to a bucket labeled “mass media.” Our awareness of media, however, has reached the collective consciousness, as if we all woke up yesterday, awakened by our programmable alarm with the iPod attachment, and over our coffee made automatically by our coffeemaker, checked our blackberry for emails and headline news and then looked up shocked to see that our kids are doing much the same. This awareness is leaving people clamoring for a new level of understanding. There is an infiltration of media applications and information technologies into nearly every aspect of our lives. What does it all MEAN? Just like Mighty Mouse (or maybe Underdog), media psychology emerged in a time of need. The goal of media psychologists is to try to answer those questions by combining an understanding of human behavior, cognition, and emotions with an equal understanding of media technologies. 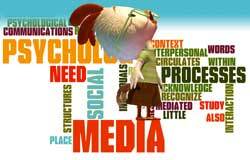 Unlike some types of media studies, media psychology is not just concerned with content. Media psychology looks at the whole system. There is no beginning and no end. It is a continual loop including the technology developer, content producer, content perceptions, and user response. Just as Bandera describes social cognitive theory as the reciprocal action between environment, behavior, and cognition, so does media psychology evaluate the interactive process of the system. There is no chicken, no egg to this system. They all coexist and coevolve with each other. There is no consensus among academicians and practitioners as to the definition or scope of media psychology. This is because the field must be representative of not only the work currently being done, but also the work that needs to be done. This is a field that changes every time iTunes releases a new mobile app. The interests of the person doing the defining often drive definitions of a field. However the fact that both ‘media’ and ‘psychology’ are themselves broad and prone to misconception contributes to the definitional confusion. In spite of our awareness of media everywhere, when someone mentions media the metaphor we fall back on is often mass media. It’s a field where you must continually define your terms. Does ‘media’ mean television or does ‘media’ include computer interfaces that facilitate information management and distribution? The same heuristics impact the popular perception of the field of psychology. There is a wide world of psychology beyond the narrow view of clinical applications that evoke images of Freud and talk therapy. So it isn’t surprising when media psychology is perceived as a psychologist appearing in the media, such as the radio shrink for many years Dr. Toni Grant or the infamous Dr. Phil. This view of media psychology also has links to the origins of first division (46) for Media Psychology of the American Psychological Association (APA). Due to the prevalence of mass media relative to other media technologies, it was home for several psychologists with media venues. The initial emphasis in Division 46 on training psychologists to effectively appear in the media, how to deliver psychological information over the media, the ethical limitations of doing therapy using media, and as a watchdog for the accurate portrayal of psychologists in the media far outweighed the emphasis on research looking at media use and development. Part of the confusion also comes from the cross-disciplinary aspects of media psychology. Not all people doing what I would call ‘media psychology’ are psychologists. In fact, much of the early work came from marketing and advertising and the bulk of the research in media psychology has been published in academic and applied disciplines beyond psychology, such as sociology, communications and media studies, education, computer and information sciences, as well as business management and marketing. What has often been challenging is the lack of intellectual cross-pollination. Media psychology seeks to address that by bringing together all these approaches and vocabularies with the recognition that communication, cognition, and emotions are pretty fundamental to human experience and therefore have, by definition, foundations in psychological thought. The rapid introduction of technology is unsettling and has triggered a spectrum of reactions, from enthusiasm to distrust. We all come to grips in our own ways with change. As technology changes our lives, we are forced to change how we view the world. Human beings are not really very good at that. Media psychology is the response to this dilemma. It is a relatively new field and hard to define. [See “Media Psychology: Why You Should Care (Part 1).”] Media psychology seeks to understand the interaction among individuals, groups, society, and technology and make sense out of it so we can make decisions and go about our lives in the most positive and productive way possible. From a biological perspective, we know that human brains are hardwired to notice change because the a change in the environment increases the probability of danger. On the Savannah, it was important to notice things that moved: tigers moved and were dangerous and trees were immobile and harmless. Nothing was more important to survival, yet nothing has such potential to cause problems today. Our resistance to change is a function of how we project our cost/benefit analysis, yet old habits die hard. Equilibrium doesn’t really exist, except in our fifth grade science textbooks. But we like to think it does because it makes us so much more comfortable. We like everything to stay put, like the trees. The human reaction to change–resistance–is normal. Humans also have the added gift of selective memory to help maintain cognitive comfort. We pine for the “good old days” and use memories of prior times as a baseline model for how things should work and how the world should be. Media psychology bridges this gap by helping us better understand some of the implications of technological change. Researchers hypothesize, operationalize, and quantify the impact of media. Research in media psychology, however, is difficult; complicated by the fact that it’s hard to realistically measure things that are so integrated in the fabric of everyday life. It’s extraordinarily tricky to separate out confounding variables in our complex world. Today, we are media consumers, producers and distributors and our choices have direct impact on what others produce for us to see. Nevertheless, as order-seeking creatures, we are looking for how to assign responsibility for change in individual and group behaviors, the social zeitgeist, and all moral failings. As in any field, these factors have stimulated a mixed bag of research—some very important and well done and, unfortunately, some agenda-driven research with less rigorous academic integrity. Research is, after all, largely influenced by how you ask a question, define what you measure, measure it, and interpret the findings. Reading the methodology section and statistical results of a research report is valuable and seldom done. This is particularly important for civic responsibility because reading apparently journalists are not required to read the actual report in order to cover it in the national press. Many articles are based on press releases from the sponsoring institutions or, worse yet, on another journalist’s interpretation. Most of the research that we would consider to be media psychology focuses on mass media and for good reason. Mass media was a game-changer, bringing information, images, and culture to a broader segment of society and the world. Researchers looked to understand what was perceived as a unidirectional flow of influence from media conglomerates, advertisers, and government bodies on the public. This media effects tradition has produced various theories—such as, the silver bullet (targeted impact), media framing (we don’t tell people what to think, we tell them what to think about), and uses and gratifications (people use media to gratify needs)–and they have evolved from viewing media consumers as a homogeneous and passive audience to one driven by individual differences and motivations. In spite arguments for reciprocity between individuals and our cultural environment (e.g. Baudrillard, Freud, McLuhan, and Vygotsky), few psychological or media theories actually focus on media as part of a dynamic interactive system including media content providers to media consumers, co-evolving in a social environment. Bandura’s model of social cognitive theory does this, but his earlier work on social learning is much more common as the theoretical framework for media effects research. Because the media survives only by arresting and holding the attendance of the audience, they deliver technology and content that viewers want. We must recognize the evolving media environment. Part of the job of media psychologists will be to take up the challenge of training the next generation to engage positively and productively with media; part will be easing the fears of the digital immigrants about the new media world. We also need to place the study of psychological processes within the context of mediated communications and recognize the dynamic role of these processes in interpersonal relations, social interaction and social structures. We need to acknowledge the reciprocal relationship between individuals and media, in other words, to own our own responsibility for what circulates in the system. As if that weren’t enough of a moving target, we need to keep this all in context. Individual experience is, well, individual, and depends on a number of factors. Goals are equally individual and not always “rational” by someone else’s standard. For example, there have been recent articles about media technologies altering brain activity, particularly as it impacts attention. But before we feel compelled to draw conclusions about something being good or bad, we need to ask questions beyond “is it different.” We need to ask what thinking skills people need to succeed in the world today and tomorrow, not in times past. Whether or not you pine for the good old days, time has the inconvenient habit of going forward—technology isn’t going away. There are several misconceptions about what it means to be a media psychologist. Since it is probably easier to say what a media psychologist is not than to define what it is, let me start there. Some of those things would be fun, of course, and some media psychologists may, in fact, do those things too, but sadly, they are not the defining characteristics of a media psychologist. The key to media psychology is this: you have to learn psychology AND technology. If you want to “practice” media psychology, you need to know how media technologies work–how they are developed, produced, and consumed. And you have to know psychology so you can actually apply it to issues of usability, effectiveness, and impact. It may not seem very encouraging to hear, especially from someone who is passionate about media psychology, but if you are searching for a profession with a clear career path, predictable income estimations, and logical next steps, this is not a field for you. As I discussed in earlier posts, (Media Psychology: Why You Should Care Part 1 and Part 2–and yes, Part 3 is the last one in case you were worried), I view media psychology as the intersection of human experience and media. In other words, media psychology is the applied study of what happens when people interact with media as producers, distributors, and consumers through the lens of psychology. I realize that definition is like waving your arms around the room and is no help at all. It makes media psychology very, very broad. Not surprisingly, the applications are also broad and equally ill-defined. The good news is that makes the potential is limitless because media psychology adds values to any place that an understanding of human behavior can be applied to media technologies. I get lots of questions from recent college graduates about how to pursue a career in media psychology. I am always appreciative of their enthusiasm, honored to represent the field, and pleased to share my views and words of encouragement. Media psychology is very exciting and has tremendous potential. This is the beginning of the field so the early entrants have the excitement and burden of defining the path. This is part of what I love about media psychology. There are no easy answers. It is not an “ivory tower” field. It requires a good knowledge base and draws across multiple disciplines because media technologies are not isolated or compartmentalized. It also requires the ability to think critically and have a certain amount of cognitive flexibility since the technologies (and thus the field) change constantly. Media psychology is also considerably more complex than focusing on media as a reflection of culture because it encompasses the integration of media technologies into life in a myriad of ways. People are now interacting with media in multiple ways across multiple platforms as producers, consumers, and distributors of information of all kinds: visual images, sound, video, text, and color both synchronously and asynchronously. My advice to recent psych grads is to get some media technology experience so that they can apply psychology to that knowledge base. If you don’t understand the technology, it doesn’t matter how well you know the psychology. This could mean anything from virtual environments like gaming, business and marketing communications, or community development in social media, to translating educational materials for technology. This can be done by working in the field in an area of interest, or finding a program in a university that has courses in both psychology and media communications and production (and not just mass media.) Areas in psychology that I think are particularly important to media psychology are cognitive psychology (how we process information, make mental models, attention, perception), developmental psychology (different stages of emotional, cognitive, and physical development across the lifespan), cultural psychology (an appreciation of how different people and cultures have different standards and goals and how that is part of the cognitive process), and positive psychology (what makes people function better both behaviorally and emotionally). As I mentioned above, being a media psychologist is not being a psychologist in the media or promoting psychology in the media. Media psychology is not a clinical degree. A degree in media psychology will not qualify you for the psychological treatment of patients in a mental health capacity. Not only will you not have the preparations, but there are serious ethical and legal consequences if you offer mental health treatment without adequate training and licensing. Being a research psychologist is somewhat different in terms of official requirements. An important component of studying psychology is learning how to do research and understand research results. (Yes, the dreaded statistics and research methodology courses.) Licensing requirements do not apply to research, however most lead researchers have graduate degrees at the doctoral level. There are also are ethical requirements when you are dealing with human subjects and therefore research done at institutions are reviewed by an Internal Review Board to make sure subjects rights and well-being are not violated by the research design. To me, media psychology is about understanding the interaction of people and media technologies in the context of the current culture. Media technologies function as a system, with a continual feedback loop between users and the producers, and thus mutually influential. As much as we’d like to blame “the media” for a bunch of stuff, it is not separable from society. Human experience does not happen independent of the current social, political, and technological environment. Media technologies are ubiquitous, with potential roles in everything from education, healthcare, science, business, advocacy, and public policy to entertainment. I have been involved in interesting research assessing website design for pre-schoolers, games that promoted altruistic behavior, developing educational initiatives that use emerging technologies like virtual worlds and augmented reality to create immersive learning environments, how technology literacy influences identity development, and how our mental models influence our interpretation of information. I also get to see media psychology in action by teaching online. Recognizing the interactive and dynamic relationship between humans and media is key to a more accurate and useful understanding of the human-media experience that is at the root of effective assessment, development, and production of media that can make a positive contribution to life and society. Psychology provides a robust set of tools that allow us to consider the implications of individual differences, group behaviors, identity formation, developmental pathways, cognitive styles, visual processing, persuasion, attention, social cognition, sense of place, self-efficacy, and a whole bunch of other really cool stuff. The tools of media psychology can only help us, though, if we are also willing, as individuals, to take responsibility for our part in the system. It is the only way we can develop better technologies and use them well. Pamela Rutledge, Ph.D., M.B.A. is the Director of the Media Psychology Research Center. She is adjunct faculty for media psychology and social media at Fielding Graduate University, and instructor of media psychology and social media at UCLA Extension and UC Irvine Extension. She is a member of the advisory board of the Social Media Certificate Program at UC Irvine. Dr. Rutledge is the editor of the Media Psychology Review, an online journal dedicated to bridging the research-practice gap to expand the frontiers of Media Psychology across traditional and emerging technologies. Dr. Rutledge authors the blog “Positively Media” on Psychology Today can be found on Facebook, LinkedIn, Second Life (avatar Media Writer) and Twitter (mediapsychology).